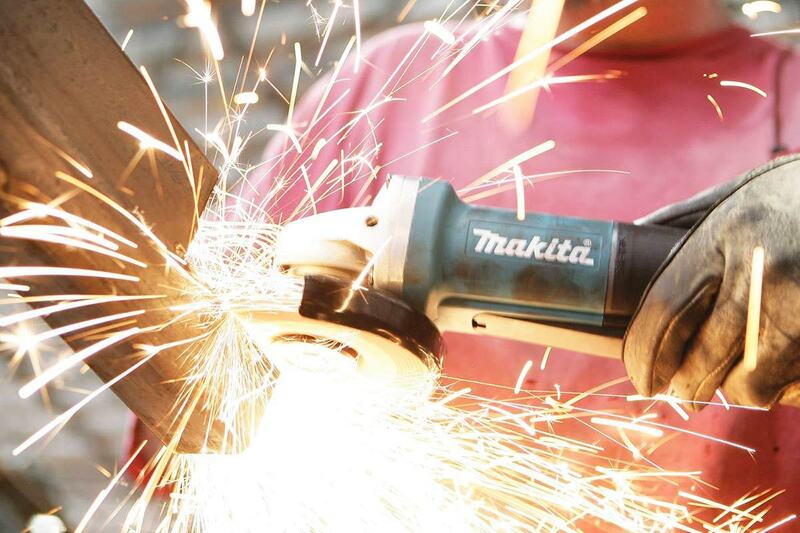 Milwaukee makes great tools--I own several of them (Read our review of the Milwaukee 18-Gauge Shear), and their durability and toughness have continued to impress me after years of hard use. 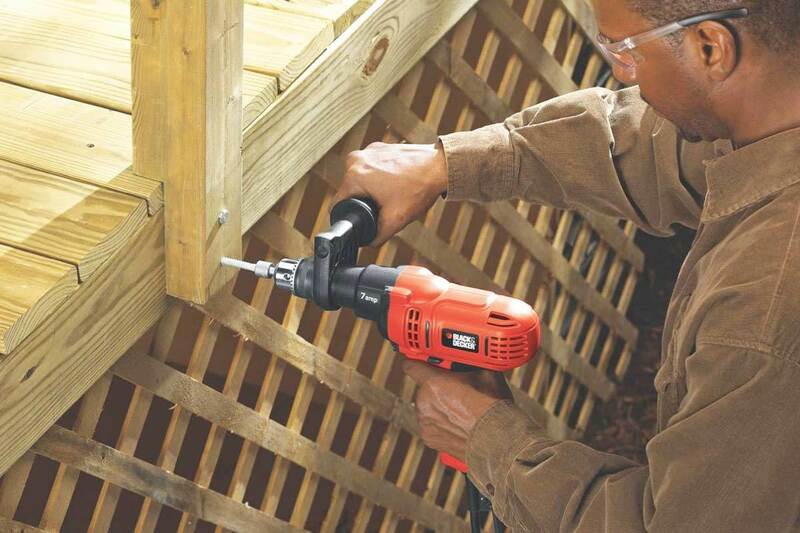 Most of the power tools Milwaukee makes cross the shark-filled moat between light-duty, consumer-specific weekender tools—which have to meet certain retail price points by not having to last beyond the standard one-year warranty—and the rugged industrial tools fulltime contractors use. This one doesn’t just straddle that line—it leaps across it pretty confidently. The Milwaukee 6232-20 Deep Cut Variable Speed Band Saw has a heavy-duty look and feel, with its durable all-metal direct drive system and what the manufacturer calls “Job Site Armor™ Technology,” a fancy brand that apparently describes a particularly tough variety of plastic composite with “crush zone barriers” built-in. What young marketing wizard comes up with this stuff? Anyway, I can testify that Job Site Armor™ works—I accidentally dropped this saw from a perilous height (don’t ask), and nary a scratch. 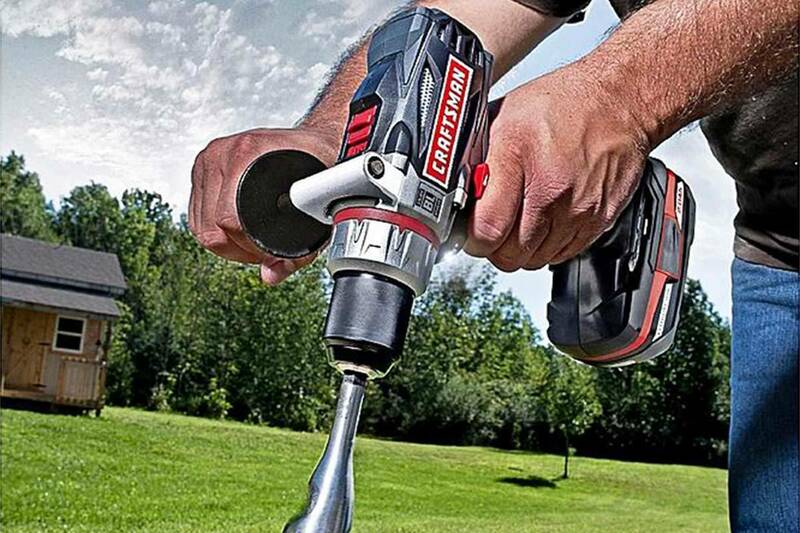 This is one tough tool. It’s also one heavy tool, weighing in at about 15 pounds. You’ve got to be a world-class bodybuilder to lift it all day. Milwaukee’s website says “this lighter weight design delivers more control over the tool and less fatigue at the conclusion of the work day.” It doesn’t say what they’re comparing it to—maybe an earlier, heavier version of the tool, or a large boulder, who knows—but holding this thing up all day would definitely be beyond my capacity, and most other people’s, too. 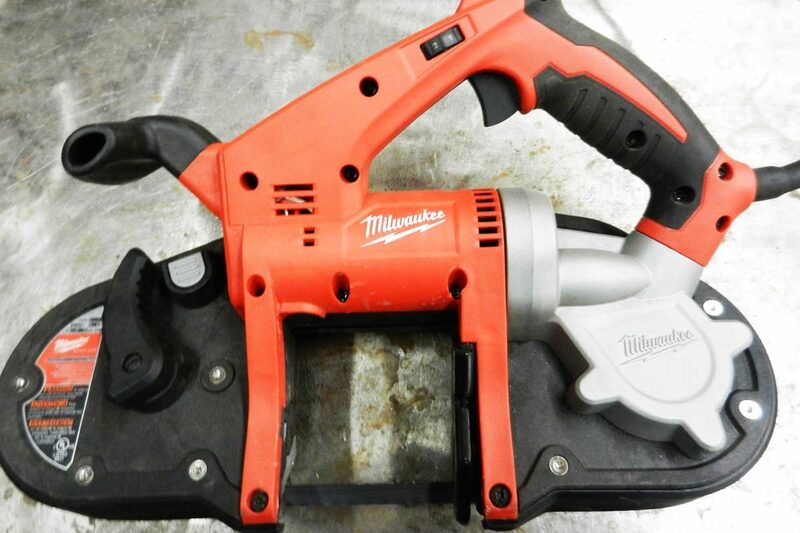 Because of its weight, this saw screams for a band saw table, a support that would convert the saw into a stationary tool—and what do you know, Milwaukee makes one that performs that job quite nicely, at around $250. Along with the $300 or so for the saw itself (average pricing at any number of online retailers like Amazon for $279), you can put together a very nice portable/stationary setup for around six bills. Where does the extra $50 come from, you ask? Band saws, I’ve found, are pretty useless without a band saw blade, which does not come along with this tool. “Band saw blade sold separately,” the website says. Huh? No other saw I’ve ever bought has come without a blade, so this is a first. Must be that same marketing department, trying to meet a price point. On the plus side, power is no problem—11 amps will pull this band saw’s blade through thick-walled steel tube or heavy plate. 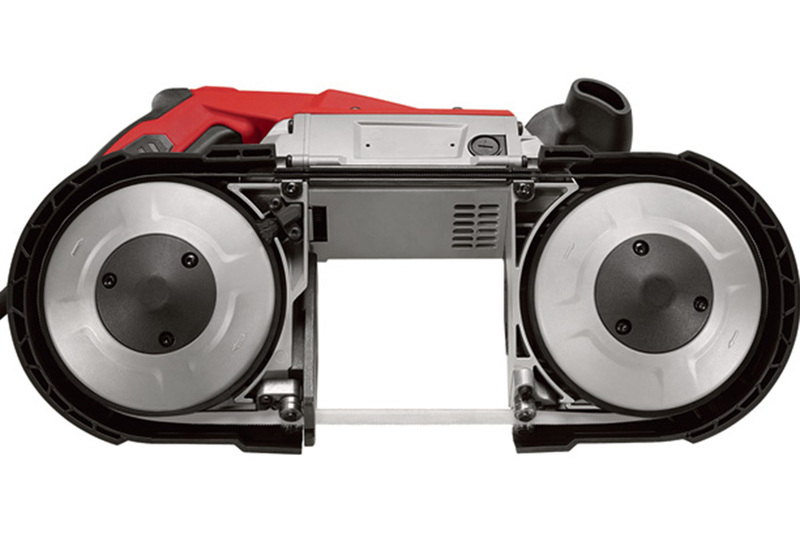 The “cut capacity” of the saw—basically the open area around the moving blade—is bigger than all the rest of the portable band saws out there, at 5 inches square. That gives this saw remarkable versatility, and the ability to cut through large pipes, girders and structural members. 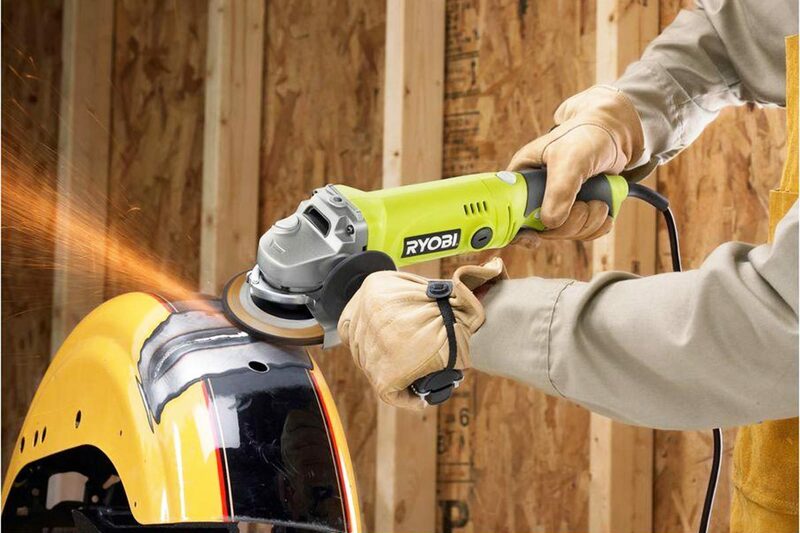 Portable band saws like this one work best on already-built metal structures like roll cages in race cars, where access is tight and materials are strong. 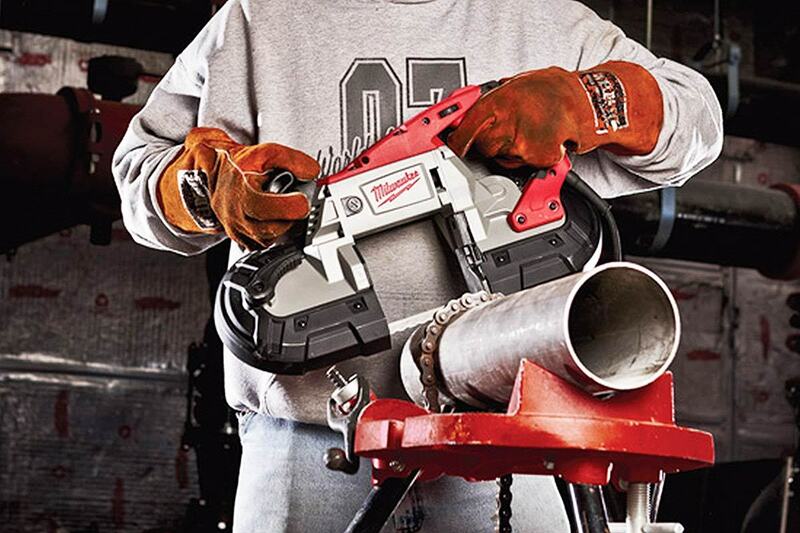 My favorite part of this saw, and of the Milwaukee Tools Sawzall™ I own, is their hard-core gear-protecting clutch mechanisms. That clutch absorbs the high impact forces caused by blade lock-ups, rather than stripping gears or burning out motors. This band saw also has a “debris protection system” (hey—I can’t believe they didn’t ™ that phrase!) which does a nice job of cleaning the spinning blade during use. This Milwaukee Tools Band Saw has tremendous power and great cutting convenience, but it’s too heavy and unwieldy to use by hand for long. A band saw that comes without a blade?